Raw Milk Rage or What's Wrong With Milk? We are involved in the raw milk issue. Because we want to drink it. Our raw milk provider (we have been participating in a local herd-share) has been targeted and attacked by health Canada. They are prosecuting and trying to put it and other raw milk dairies out of business. 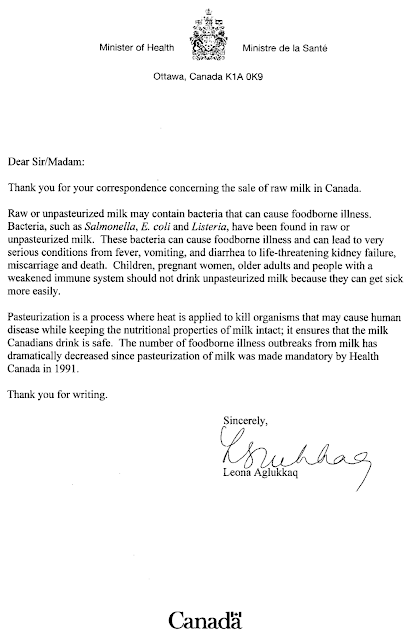 A month or two ago I sent a letter to Leona Aglukkaq, Canada's Minister of Health, regarding my desire to see raw milk legalized, and for them to stop harassing those who make the food we want possible for us. Her response, below, shows the sort of blindness that our public officials have for our health and for science. They work for the people who fund their campaigns and paycheques. And, despite all those taxes we pay, that's not us. Read her letter, here (click to enlarge if it's too small to read, here). And then read my response, below. Well thank you for your predictable, closed-minded, and short-sighted response. I expect you will immediately be outlawing honey, tunafish, all poultry, all processed meats, and all other foodstuffs that have been shown to carry the risk of contamination by those same common pathogens. In short order we should be allowed a diet of pure chlorine bleach, since it is one of the only things currently found in our diets that does not, in fact, risk harbouring these bacteria (yes -- chlorine bleach is used to sterilize the chickens you allow us to consume, and, despite claims that it dissipates before consumption, it does leave traces on the food and in the packaging). I will take your letter public, now, and, instead of depending upon you to protect my food sources, out you as a supporter of the dairy corporations, who find it reasonable to squash small farmers and endanger the public health with false claims that their milk (sic) is healthy. It is now becoming common knowledge that most of the beneficial nutrients found in milk are destroyed through the pasteurization process. The milk which you allow us to consume is sourced from various farms in various countries, to maximize the profits of the large dairies that produce it. It is not fresh, it is not very well regulated, and sometimes it is not even pure milk. The mixing of milk and cream from various sources requires the dairies to homogenize the milk, which makes the fat molecules so small that they pass through our veins and cause blood-clots and other life-threatening damage. So you tell us to consume low-fat milk, to minimize our ingestion of these smaller fat molecules, but still promote the consumption of cream, butter, and cheese. But I assume this does not concern you. It is, after all, more important that you support those people who pay for your position of authority; not the public. I have been drinking raw milk for 6 months, and was happy to find my health returning, as I, who have a compromised immune system and small children, was not sick during that time, following many years where I contracted a virus every month or so. Thank you for your response. It will allow me to show publicly how little you do for us. This is perhaps a little bit obvious to most unschoolers, but I just have to put this out there: The absolute best way to educate a child is to allow that child to experience life - to be included. Take them with you. Welcome them at town-hall meetings, in social settings, in business settings, at fancy restaurants and at late-night neighbourhood parties. Welcome them at mealtimes, working times, playtimes, in your bed at night, and while you are taking a bath. Allow them to experience the security of being always welcome. Show them your humanity and allow them to feel human, too. They look to you to show them what it is they will grow up to be like, so be everything as beautiful as you dream of, and welcome them in to share it with you. Obviously there are some things that may be inappropriate for young children. But for the most part, we need to welcome children into our adult world. And really -- if things are so violent or overtly sexual that they may harm a child's psyche, what are they doing to our own? Is it healthy for us to be witnessing or participating in those activities? Experiencing violence has been shown to cause permanent changes to the brain, which may in fact influence a culture for centuries to come (1). So can we extrapolate that an increasing percentage of our population, while having grown up in a relatively violence-free physical community, is in fact suffering from various forms of violence-induced stress, physical and mental illness? I think so. For my part, I avoid violent media regardless, because I am aware of the effects it has on my own psyche. It's not difficult, in that case, to ensure my children's psychological safety, when they're in my company. On the rare occasion that we do witness or hear about violent or other upsetting acts (usually on the news), we take time to discuss with our children the act itself, the context and ramifications, and every other issue that might arise, at any length they desire, as often as needed. I feel that being open to discussion - to educate them - is the best way to keep them emotionally safe from the reality of violence in their world. Finding intimacy with partners can seem challenging when we want our children to be always welcome in our presence. But I think that a moderate level of intimacy is perfectly acceptable for children to witness; it lets them know that this is normal. Parents kiss. They love each other and they comfort, caress, and care for each other. We explain to our children that it makes us feel shy if they see us making love, so for that reason we do it in private, but we are willing to talk to them about anything they are curious about, and encourage them to ask questions. It's not always easy for us to be so open, but I know that the physical, emotional and sexual behaviours we model will be the foundation of their own future relationships (2), so it's vital that we allow them to learn from us rather than from whatever they might find in the media. It therefore also behoves us to ensure that our relationship is as healthy as possible, not only for our sake, but for theirs, as well. I think there's a misconception that children will be uncomfortable or bored by our activities. To some extent that may be true, but often it is not. Often children are not given the chance to discover for themselves whether they're interested, and often they're shamed into not participating by adults who are intolerant of their sometimes noisy presence. This isn't the children's fault; it's ours. I think it's up to us, as their role models, to welcome them into our circles; to help them engage in and enjoy the experiences. It is up to us to ensure that they have plentiful opportunities for participatory learning. For example, it is one thing to do online and library research on astronomy; it is quite another to go out at 11PM with the local astronomy club and look at Jupiter's moons through the telescope of a neighbour. The feeling of engagement and inspiration that comes from that community-based learning experience is the spark needed to make that astronomy knowledge valuable. Yes, kids may indeed be bored when we bring them to board meetings for societies whose goals or activities they do not understand. But my experience tells me that if they are involved in the societies, and if we take time to explain to them the meaning and necessity of the conversation, they may actually become interested. During one of the Occupy meetings at the Vancouver Art Gallery, my daughter was getting bored, so my husband offered to take the kids off for a walk. 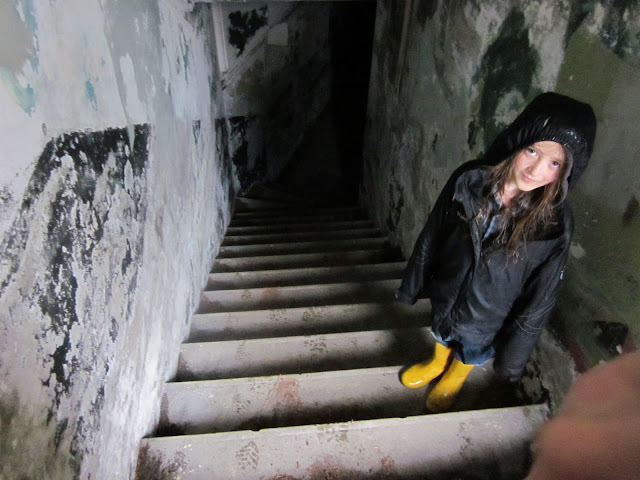 9-year-old Taliesin didn't want to go. "No. Sh." He muttered, and returned his attention to the conversation being held. It was a rather dry group discussion about consensus decision-making and meeting protocol -- but it interested him! Neither of us expected him to care; we just took our kids along with us because we take them pretty much everywhere with us. But it turned out to be one of the most inspirational experiences of this season, for him. At other times he hasn't been so interested in the conversations at Occupy, but his involvement there this autumn has given him the chance, at least, to have felt his presence was valued, and I think that's vitally important. My Mum has just begun a 4-week Canadian Folksong workshop -- for all ages. This past week as I sat (coincidentally, at her knee) with my daughter, singing the songs with her and generally enjoying the workshop, one of the participating parents asked how I had learned all of those songs from her, and I was rather at a loss to explain. She did come in and teach some at my school when I was a child, but by then I already knew them. I just learned them by living with her. We sang for entertainment while cooking, while walking, and on car-trips. And, since folk music is her interest, we accompanied her to traditional folk events, and sat around while she sang and performed with friends. That was just simply our life! I became interested in traditional folksong, too, and my brother did, to a lesser extent. But I blame his keen interest in human history on the traditional stories she passes on to us. And of course, now I bring my kids to everything I do, including music gatherings. There isn't a method to it; it's just life. Learning does not come from an orchestrated input of information into our children's brains; it comes from their own navigation of the things that interest them. I think most of us know that, but do we understand it? Do we realize that learning does not necessarily involve a core of expected knowledge, or even any outcome at all, but that learning is actually a very un-orchestrated opening-of-the-mind? Learning is what happens when we feel. That feeling can involve any or all of our senses, and emotions, but that feeling is essential for the learning to happen. We talk about tactile learners, visual learners, auditory learners, etc. Those are ways of feeling! So when a child feels safe, accepted, and welcome to feel and express whatever s/he experiences, then the opportunity to feel is full, and s/he can learn. Dr. Candy Lawson states that "Emotions are the relay stations between sensory input and thinking. (3)"
If we make our children welcome in the most austere intellectual conversations, we give them the feeling of being valued for their intellect. If we make our children welcome when we socialize, then they know they are a part of our community; they know they are our friends. If we make our children welcome when we play, we let them know that they are a part of our life's happiness. If we make our children welcome in the cooking, cleaning, and repairing of our home, then they will know that the home is also of them (4). If we make our children welcome when we eat, sleep, and bathe, they will know that they are integral to our very existence. Self esteem goes much deeper than knowing that we are good, beautiful, and comparatively smart. In fact, comparison of any kind is probably detrimental to self esteem (5). Self esteem comes from the feeling of acceptance in our communities; of knowing that we are valued simply for our presence. And our children's involvement in our communities is obviously vital for that value to be perceived. The call was so controversial that I actually lost a good friend because of it, and I left it behind. However, I still meet people quite often who are either alarmed or thrilled that my kids don't watch TV; that they aren't aware of current trends and popular brands. So... just for those of you who came here for this information, watch the important documentary below (full-screen it, sit back, and make some non-GMO popcorn... ha). And yes, my kids are happy, busy, and educated. When given the option to watch TV, one of them wanders off, and the other stares intently until the thing is turned off. However neither of them misses TV, advertising, malls, brands, or processed food in their daily lives. How have we achieved this? Simply by living it; by rejecting all forms of advertising in our children's lives: cartoons, Scholastic, TV, processed food, Fast Food Chains, popular (cheap plastic) toys like Barbie and Nintendo, video games, candy, and pop music. We just don't do it. Of course we can't cut out everything, but we cut out most. And what we can't avoid, we can use as a teaching tool. Our kids have been made very aware of marketing in their world, and, especially for my 9-year-old, I don't think much gets by unnoticed. This documentary contains a segment about screen violence that is EXTREMELY gory and upsetting. It is too much for me to watch, myself. I would NEVER show it to my children. In her article published in the Guardian, Naomi Wolf writes, "In other words, for the DHS to be on a call with mayors, the logic of its chain of command and accountability implies that congressional overseers, with the blessing of the White House, told the DHS to authorise mayors to order their police forces – pumped up with millions of dollars of hardware and training from the DHS – to make war on peaceful citizens." I am grateful for this article (and hundreds more like it) because, like all of us, I am affected deeply by the implications of the throttling of our media, and brave writers like Naomi Wolf are guiding us out of this stranglehold. The photo associated with this article is of Brandon (Romania) Watts -- I watched him being brutally beated, crushed, undressed and hauled away by the cops on livestream, as I was watching the OWS event where it happened. This incident, as well as the rest described in the article, as well as the article itself, is why social media and brave reporters are now more important than ever. Because we're realizing that we need to know the truth, and we (the people) need to depend upon each other to find it. Our Christmas tree, a few years ago. As many are already aware, today is Buy Nothing Day -- Adbusters Magazine's call to action against Black Friday -- purportedly the busiest shopping day of the Christmas season. Since my family rarely buys anything anyway, this day doesn't mean a whole lot to us, but I thought I'd post here about our Christmas plans for the year. We are going gift-free, this year. In past years we've elected to go on a family outing instead of exchanging gifts among those of our household, but we still exchanged gifts with others in the family (grandparents, aunts, uncles, cousins, close friends, etc.) Although I personally love giving and receiving gifts, and cherish many of the thoughtful gifts given to us by those we love, we are literally inundated with these beautiful things each year, so that we now spend days going through our belongings every year, choosing things to give away to make way for the new -- and often that's very hard to do! So we end up packing things away into the attic, under the beds, into the office and the studio, etc. The outcome of this, of course, is that we are now suffocating in our belongings. We love the gestures of those who love us. And the objects they give us are usually very meaningful and/or useful. We love spending time giving gifts and watching those we care about (hopefully) enjoy their gifts. We love this time so much that I've spent the last few years creating cloth wrapping bags (as needed) so that we could have a beautiful assortment of wrapped gifts sitting under the tree, without having wasted paper, in the end. But the time has come for us to receive no more. This year we want to cherish the time with those people, talking, singing, sharing and feeling each other's presence. My family has always done this, so it won't be much of a change, but we'll have to find some activity to take the place of the usual Christmas morning exchange with our family. We have some ideas about this, such as sharing stories, songs, or poems, watching a slideshow of old family photos, etc. but none of these has been received with much enthusiasm, so far. We'll have to see what transpires as December unfurls. I look forward to doing a little more baking, this year, and making a few more fir-bough-garlands to decorate the house. I hope that the time not spent shopping and wrapping will be as valuable as I imagine it will. Michael Stone speaks in Vancouver about where the Occupy Movement is headed. What is our aim, as a movement? How will we work through our anger at the systems, at the evictions, at each other, and find our strength in peace? "We won't give them demands because we're articulating a much bigger dream, and we won't give them violence because we're taking care of our anger." "Don't be afraid to talk about love. Don't be afraid to talk about kindness." Come down to the Vancouver Art Gallery. Look at those tents! I've met many people on the streets downtown who say they're "ugly", "slovenly", and "pointless". Then there are those who tell me the Occupants are "a bunch of bums", and "should get jobs and stop living off everybody else's tax money". You know what I say to those people? I tell them that I am an occupant. And I encourage them to go meet some of the rest of us, and to see what beautiful things are happening beyond those tents. It just requires a bit of open-mindedness, a willingness to meet others and to hear their ideas, and a willingness to enjoy. So here you go: A partial tour of Occupy Vancouver. Curious what's happening? Stop in at the info tent! If they can't answer your questions they can at least direct you to the person who can. Near the info tent is the art tent. Donate materials or just use the paints already there. Make some art! Make some signs if you'll be participating in a march! Near the art and info tent is this wonderful climbing tree, and the intriguing announcement about the "Occupy Choir". We wish we'd been there at the right time to see the Occupy Choir! Check out what's happening on the mainstage. Throughout the day various speakers and musicians take the stage, and between those main acts is music and open mic. Last time we were there, Rhiannon stood around singing Imagine to herself. So I suggested she go sing it at the microphone. "No!" She said. "I don't know what order all the words go in!" So off we went to her Pappa's office, where she looked up the lyrics on his computer, printed them, and brought them back to the Occupy site. She bravely walked up to the people on the stage and asked if she could sing, then, just as she began to walk onstage, turned back and asked: "Is this song called Imagine?" If you can stay past 7PM, you can participate in the General Assembly. And if you do, you may find these hand symbols helpful! On the stairs next to the stage is this instruction-manual for participation in the GA.
Should you injure yourself, forget to keep warm and suffer from hypothermia (apparently this has been an issue for some), or suffer from any other ills that humans do, you can make your way to the medical tent, where professional medics volunteer their time in shifts to help those in need. There is somebody available 24/7. And should you just need supplies, the infrastructure people can help with that. Rhiannon, though, found the children's section on her first visit, and returned there many times, even making use of the check-out system to check out and return a book she liked. As I said, there are many people to talk to. It's really a very welcoming scene, down at Occupy, with many engaged people, willing to speak and listen; share ideas; inspire and BE the new reality. Peace Keepers (Occupy Vancouver's Security Committee) are here to ... (how could you guess) keep the peace! Thankfully there isn't often a lot for them to do, but when friction does arise, especially with Vancouver's not-so-peaceful tactics against the occupation, the Peace Keepers are there to help diffuse. They've also held workshops on peaceful de-escalation tactics, etc. And should you want serious, inner peace... go meditate. This is for everyone, of every belief-system. Enjoy. I always say that, as our children are unschooled, they make their own educational choices, and may choose at any time to go to school. They may very well decide to go to University, as most of their family has, for generations. But we're not outrightly encouraging it. That will be their own choice, and we'll support them in however they make it. The Government of Canada (or is that the Harper Government?) will match a certain amount of any money which we put into RESP's for our children. BUT, should our children decide not to attend one of the specifically accepted institutes for higher education, they will be required to return that money to the government. So, yes, we could take a gamble that indeed has very little risk, for the potential benefit of having many thousands of dollars returned for our children's university education, should they decide to go that route. But what is the cost of that gamble? The cost is that we must sacrifice the opportunities that the money we might invest could otherwise provide for their education NOW. We have very little to invest, to begin with. And we feel that it is of greater value to their lives to save that money and spend it on a family trip that will allow them to get to know their family in Europe, as well as to spend time there, broadening their understanding of different languages, cultures, and technologies. The month-long road-trip that we made this past June was probably the greatest educational experience we've ever provided for our children. In addition to the expected learning that we gained from visiting different communities, cultures, museums, etc. we also gained an intrinsic basic understanding of the geology, humanity, and ecology of the US West Coast. We gained an intrinsic understanding of the meaning (and non-meaning) of borders, of politics and pop-culture, of distance and quantity of space, time, and resources, that we never could have achieved by studying in a classroom. The month-long trip cost us about $3000.00, and we'll be paying it off for at least a year to come. But was it worth it? Absolutely! My own parents spent about $25,000.00 -- a great deal of their own investments -- putting me through two years of art school, in the Netherlands. I learned very little at that school, and ended up leaving with an Incomplete. But I don't think my parents really understand the return I got on their investment. What I learned from living in the Netherlands on my own, from getting to know my family, there, from speaking another language, and from having to make ends meet (I created jobs for myself to supplement the money they gave me) was probably the second greatest single learning experience of my life. I came home to Canada, but that experience, and my knowledge and understanding of that other part of the world informs every day of my life here, and expands the value of the experiences I have, here. My parents' investment in my education really was of enormous benefit to my life, but not in the way I expected, when I first registered for the school. I did return to college in Canada to study biology and English, and then to University to attain my degree. And luckily, because I worked during that time, and was also supported by my husband, do not have any student loans. But that degree has done nothing for my career. I chose to have children, and that, after all, has been the single greatest learning experience of my life. Now all my work (artistic, community, etc.) is about mothering. My mother, my children, and my community have been my teachers, as well as the many authors and speakers I've chosen to inform myself with, over the internet and through books. And finally, I feel as though I have value. I am aware that my art finally has value, too, since it's about mothering, and therefore I'm finally creating from a place of deep understanding. And I can absolutely say that I learned none of this in school, but that the money my parents put into my education -- living overseas -- made a great difference, indeed. I just watched a video (unfortunately named College Conspiracy - watch it here), put out by the (US) National Investment Association, which explains some of the (global economic) reasons we've decided not to keep RESP's for our children. Generally, the current system of high tuition, crippling student loans, and standardized learning (as opposed to individualized community-based learning, where students learn within the community they wish to serve) is unsustainable. In addition to this, I believe that the predictions of a coming global depression are well-founded, and that such a depression would not only radically change the structure of higher education, but that anything we may save, or the value of that money in general, is at extreme risk, if stored as RESP's. In fact, even if there is no depression, I would like to see radical change in our education systems, and that kind of change does not happen by first fitting into the existing system. That kind of change is happening already, as so many of us are rising up with new movements such as unschooling, and creating the world we want to live in. 1. That we should invest in physical gold and silver because it will be the only thing of value in the coming depression. Well, since when are gold and silver valuable? Value is created by need and desire. I believe that there will be need and desire for food, shelter, and compassion. But better than investing dollars in agriculture, construction, and humanitarian services, we can give up entirely on the notion of financial investment (if there's a global depression, our money will be value-less, anyway), and invest in our own personal education. We can LEARN, and we can build community. After all, in the absence of money, knowledge and skills are the new currencies, and community is our school. 2. That online degrees are the answer to the inflationary college degree scenario. In the film, Gerald Celente of the Trends Research Institute suggests that online education can and should take the place of classroom education, for its cost-saving benefits, and the ability to reach more people, more easily. I hate to say it but I think this is shallow. It assumes first of all that a degree will be useful, and secondly that mass, standardized education is valuable. Above I say that knowledge and skills are the new currencies, but if we all learn the same facts, while staring at our Skype interfaces, how are we adapting that knowledge to the specific applications where its needed in our communities? We have to get out there and apply it before it has any value. Sure, there's a certain amount of information that will be usefully learned, this way, but much more understanding will come from our interaction in community. And if we go out into our communities to learn, instead of sitting at home with our laptops, then I think we'll be learning much more of what is really important for us to know. So the College Conspiracy film just doesn't go far enough for me. And then the whole thing disintegrates into an ad for the National Inflation Association. Or perhaps it was that all along... this is one hell of a long advertisement. NIA does claim that its goal "is to help as many Americans as possible become aware of the disaster we are rapidly approaching", and also that they "are not investment or financial advisors". And yet, they are giving plentiful investment advice. Sadly, NIA falls short of its stated goal by failing to actually escape the money trap. Although they interview a farmer in this film, and he discusses the value of real employment, with an anecdote about his grandson chopping firewood, the film never really explores that aspect of the economy. Neither a cheap online college degree nor gold and silver investments will help a society that has lost touch with the provenance of the fundamentals of human life: food, shelter, and compassion. The pillars of our children's education are their involvement in the world around them: they have a deep understanding of their natural surroundings, ecosystems, and the provenance and value of their food. They are involved in the maintenance of our home and community. They are involved in their community's politics, festivities and conversations. I believe that the education we're giving our children, which is rich in understanding the physical world they live in, how it works, and how they work within it, will be the cornerstone of their ability to lead a life of value. With that upbringing as their strength, we trust them to make their own decisions on how they will seek and learn the skills they desire to participate in their world. This may include University, trade-school, apprenticing, travel, or any number of other participatory activities from which they wish to learn. Death at Occupy Vancouver, today. It is a very significant and reportable phenomenon that so many homeless, mentally ill, and addicted people are making the occupy movement their home. 1. They find support, food, and shelter, there, which is in short supply elsewhere. 2. They find acceptance, because acceptance of EVERYONE is a cornerstone of the movement. 3. Many of them feel like the 'system' has failed them. And it has! Who more than they needs this movement to heal our very broken system. They are unrepresented, but at occupy they have a voice. Is it a problem for the movement? Well, the presence of drugs and the risk of overdose-related injury and death, and/or drug-induced behaviour issues does deter many others from joining. I've been uncomfortable there a few times, myself, but never threatened, as I participate and have camped there with my children. And really why should we be so alarmed to have this reminder of our failed system brought out onto Georgia? If you look closely it was there already. Just a few blocks down the street we can blissfully turn a blind eye on the most destitute community in Canada, walk past them with our shopping bags, give them a few coins, and go home. Yes, it's uncomfortable that they're occupying the VAG, too, but THEY are part of US. And it behoves us to find not only place for them in our hearts and in our aspirations, but also in our communities; solutions that include them as part of the whole that we are working towards.